1. 1 1/2 pounds(lbs) elbow macaroni. 2. 12 ounces ham, cooked, cut julienne. 3. 3 ounces green onions, minced. 4. 3 ounces green peppers, diced, blanched. 5. 1 pound(lb) celery, diced. 6. 6 ounces Longhorn cheese, grated. 7. 1 cup sweet relish. 9. 3 ounces pimientos, diced salt and white pepper to taste. 10. 5 hard boiled eggs, chopped. 11. 25 leaves romaine, bib or iceberg lettuce. 12. 1/3 cup chopped parsley. 1. 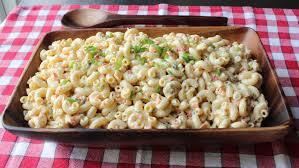 Boil the macaroni in salt water, drain well, let cool and place in a mixing container. 2. Add the remaining ingredients, toss gently until ,thoroughly mixed. Season with salt and pepper. 3. Line each cold salad plate with a leaf of lettuce. 4. Place a mound of the salad in the center of each lettuce leaf. 5 Garnish with chopped hard boiled eggs arid parsley. 1. 4 pounds(lbs) cabbage, shredded. 2. 1 cup green peppers, chopped fine. 3. 1/2 cup green onions, chopped fine. 5. 1 tablespoon celery seed. 8. 2 tablespoon lemon juice. 9. 1 tablespoon vinegar, cider. 10. 1 teaspoon horseradish salt and white pepper to taste. 11. 25 iceberg lettuce cups. 1. 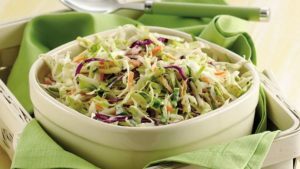 Combine cabbage, green peppers, green onions, carrots and celery seed in a mixing container. 2. Whip the cream slightly and blend in the mayonnaise, lemon juice, vinegar, horseradish and season with salt and pepper. 3. Pour this mixture over the vegetables and blend thoroughly. Cover and place in the refrigerator for at least 2 hours. 4. Place a crisp lettuce cup on each cold salad plate.